My favorite winter-time health supporting drink is by far “golden tea” or even “golden milk” (especially the latter for my kiddos). The last flu season was brutal for us and I kept those roots simmering on my stove top as a lifeline. Summer is a great relief from colds and flu and yet I still find myself dragging. Being a mom of young boys is never easy. Being a mom of young boys who is herself of “advanced maternal age” (*cough*) adds another layer of challenge and so I find myself dragging around, wanting to get out and live a whole lot more, trekking here in the Sequoia National Forest and playing in seasonal creeks like Huckleberry Finn. The creek play will have to wait until both California’s epic drought has turned and until I’ve had a lot more of the beverage at hand. And so I am here in the summer dragging in the swelter and it occurs to me that my go-to winter drink needs only a tweak to help me out and so the “golden spice” sits in my refrigerator in a jar, ready for the day. This is a tea, just like the wintertime version, except that it is cold (at the risk of being overly obvious…). I make a very strong tea base to use as a concentrate and then add carbonated water because I love the fizz. The fizz part is obviously optional. You can also make this tea with fresh root or powder. I provide a starting place below for each. 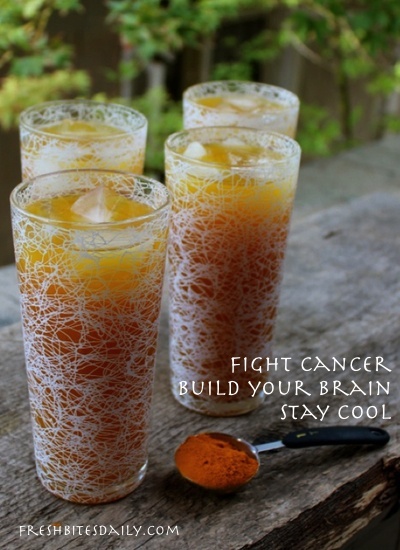 Turmeric is a cancer-fighter: Curcumin in turmeric is probably most widely known for its anti-tumor properties. Turmeric builds your heart and may reduce your symptoms of depression, both in part at least to its anti-inflammatory properties. 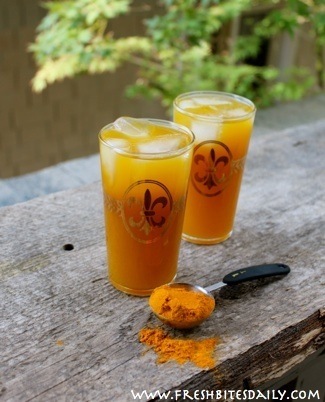 Turmeric may relieve arthritis pain by reducing joint stiffness and swelling. Turmeric may reduce your risk of Alzheimer’s Disease due once again to its powerful anti-inflammatory properties. Read more about it and follow up on the research citations (here). As for a summertime beverage, I was inspired to try this otherwise-very-wintery beverage as I sat in the swelter feeling that “summer puffiness” — that water retention from the heat. As I sit I can nearly feel that mild inflammation in my cells. Ugh. Drag. Before diving into this recipe, you should know that turmeric has a strong flavor on its own and it not particularly pleasing on its own. The ginger and honey make all of the difference in the world. 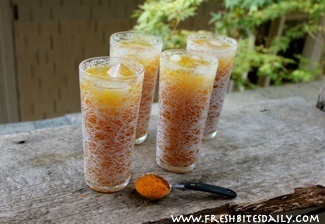 In fact, if you’ve had a turmeric beverage and nearly gagged, you will want to give this version a try. 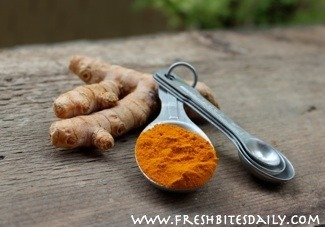 If you are hesitant, double the ginger portion to cover the turmeric flavor more. Ginger is wildly healthy too. You cannot lose. If you find the drink to be bitter, you might not be heating it enough. My picky-eating sons love this drink and actually discuss this key point in a little video below. In any case, use these recipes as a starting point and make adjustments to make this your own. You may want to dilute it quite a bit just using the concentrate as a bit of flavor to your water. My basic ratio for tea is one teaspoon each of dried turmeric and dried ginger per two cups of water. The recipe below makes about eight cups and fills a nice half gallon canning jar that fits well in my refrigerator. You can also just refrigerate the base concentrate and add water as you drink your tea. The black pepper in the recipe simply helps your body absorb the curcumin in the turmeric. 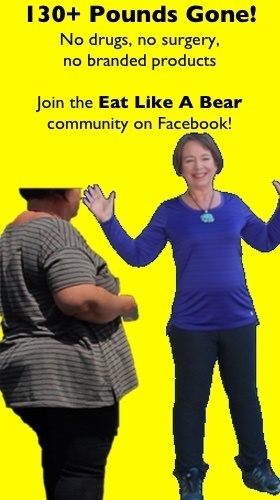 It doesn’t take a lot and you can certainly add more if you wish. Cover your pan and allow it to steep for an hour or so or even overnight. Strain out the root. If you are using fresh root, you can save it and make more tea. If you are using powder, I recommend straining your mixture through cheesecloth or a tight-weave strainer just to remove some of the gritty powder. The texture of your drink will be far better. You now have a concentrate. Cool it in your refrigerator and dilute it to taste. I would add an extra six cups of water to the mixture as the recipe calls for but you may want to add far more water for a lighter beverage. Experiment. I also want to point out something epic about this iced tea. My boys drink it. I didn’t have to beg them or pay them to do that. They saw the tea and wanted to try it. I pretended like it was any other beverage. They drank it and wanted more. I died a small death. The drink the winter version and so I suppose I shouldn’t be surprised and yet I always am.